I love Barbara Pym – not as passionately as some, but I don’t think love is too strong a word. And yet, as Barbara Pym Reading Week approached her books were not calling me. It might be because the last of her books that I started – Less Than Angels – I didn’t get on with. It might be that my state of mind needed a different book. Or it might just be that I’m naturally contrary. I thought I’d just let the week pass me by, but as I saw Pym posts popping up here there and everywhere, a certain book began to call me back. The Sweet Dove Died. It was the first Pym I read, five or six years ago. There was no particular reason for starting there, towards the end of her writing life, but I saw a copy in the library and the title intrigued me. Why, pretty thing! would you not live with me? … and it’s rather apposite. The story opens in a London auction house. Humphrey Boyce, who owns an antiques shop, and his nephew, James, who works with him, are both there. They rush to the aid of Miss Leonora Eyre, who has fainted, overcome by her success at her very first auction, and a love triangle begins. James was a young man he wanted a girlfriend. He had Phoebe, who lived in the country, who he visited there. He didn’t treat her very well, and she was bright enough to know that but too smitten to admit it. But actually James might have preferred a boyfriend. He met an American, Ned, on his travels, and Ned came back to London with him. None of this suited Leonora at all – she wanted to be the centre of attention! Phoebe put up a good fight, but Leonora saw her off. Ned though was more troublesome, because he saw what Leonora was, and because he wasn’t nearly as attached to James as James was to him. The story plays out beautifully. Leonora is a wonderful creation. She is a wealthy, elegant, and beautiful middle aged woman, who lives alone, with little to fill her time, save indulging her own pleasures. She dines out with men who are never encouraged to expect more from her than her company at dinner. Her female friends are few and far between, and she keeps them at arms length, expecting them to admire her while she takes no more than a token interest in their lives and concerns. She is proud and aloof, but she is beginning to see signs that she is ageing. That worries her, and it makes her vulnerable. Barabara Pym draws Leonora’s character so very well that, that even though I didn’t like her I began to feel for her. I couldn’t feel the same way for Humphrey and James: the character of the former was too simply drawn and the character of the latter was a little unfocused. I was rather more interested on the characters on the fringes of the story: Phoebe was a lovely girl, Leonora’s lady lodger, Humphrey’s long serving secretary. They were churchgoers, they would have enjoyed a jumble sale, they would have been at home in an earlier Barbara Pym novel. Most unlike the central characters! The observation was wonderful, the consideration of serious themes was wonderful, but there was something not quite right. The tone – it had the lightness, the wryness of early Pym – and in this rather different, rather darker, book that wasn’t always right. I did enjoy my re-read, and knowing the story freed me up to notice things I hadn’t before, but this time around I appreciated the Sweet Dove Died a little more than I did last time, but I loved it a little less. I read this a few years ago – I don’t remember it that well though I know I liked it. I am looking forward to re-reading it later in the year for the LT read-a-long. What an interesting distinction – appreciating it more but loving it less. I need to think about that! I don’t remember hearing about this book before. I need to start making a list of her books. None of those I have has a complete list – they only give one or two other titles. I’m re-reading this book at the moment and don’t remember how it ends. I’m just starting to feel for Leonora a bit, because I think she could end up being very lonely, but I really don’t like her. I would have liked to read more about Miss Foxe, she was so much nicer. James is so shallow it’s hard to be interested in him. 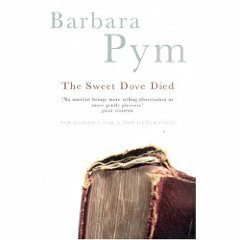 This was one of the first Barbara Pym books I ever read, several years ago. I don’t remember a lot about it except that there was something about antiques and that it left me feeling sad after reading it. Perhaps I need to re-read it sometime. Like Ali I am going to be reading this along with the LT group later in the year. I’m glad you re-read it because I knew nothing about it and am now looking forward to the story. I feel that the book I read this week, Quartet in Autumn, also had a problem with tone – the lightness in a dark and depressing novel didn’t really work for me either. I’m looking forward even more to reading this one. Though I rather think that if I was a wealthy spinster with my own house, I might be more likely to get a couple of cats and some good books and leave the men for others!